A while back I wrote a blog post titled Which Kindle is Best? It has been read by thousands of people, and has become one of my most popular posts. 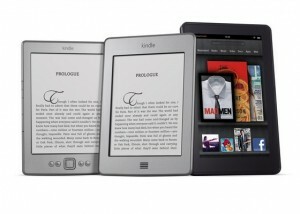 Amazon recently introduced some all-new Kindles, and they are generating a whole lot of excitement. And for good reason – these new products are breaking new ground in terms of price and performance. If you are a little confused about how the Kindle machines compare, what their features are, and maybe even some pros and cons of each, you are in the right place. We’ll cover all the necessary information here – first in a quick summary, and then in more detail. See the end of this blog post for information that applies to all of the Kindle models. Amazon now offers 7 different versions of the Kindle: Kindle, Kindle Touch, Kindle Touch 3G, Kindle Keyboard, Kindle Keyboard 3G, Kindle DX and Kindle Fire. This is the Kindle in its most basic form. For the low price, you are giving up a couple of features. The biggest one is the physical keyboard. In order to type something on the screen, you hit the “keyboard” button and a keyboard appears on the screen. You then navigate to the various letters by manipulating a 5-way directional controller at the bottom of the unit. Some people will find this cumbersome, but how often will you need a keyboard when you are using your Kindle? This will vary among users. The other feature that gets minimized with the Kindle is the amount of internal storage. It comes with 2 gb of space built in. While this is the least amount of storage of any model, for most users it probably won’t be a problem. First of all, how many people need quick access to more than 1400 books? Second, Amazon offers free cloud storage for any digital product you purchase from them. So if you bought a book, and it’s not stored on your Kindle already, you can get it from Amazon through any Wi-Fi connection (you download it to your device, then you can read it later even when you don’t have a Wi-Fi signal any more). The Kindle Touch is virtually the same size as the basic Kindle. It’s less than a third of an inch taller, and less than a quarter of an inch wider. If you watch the promo videos by Amazon, they’ll tell you it’s small enough to fit in your back pocket – but that’s a stupid place to carry it. Kindles tend to be fairly delicate, so if you happened to sit down with one in your pocket it’s probably a goner. As you can figure out by its name, this version has a touch screen. This is in line with the trend for all electronic devices to implement touch-screen controls, and it does make navigation pretty convenient. You can use your finger right on the screen to turn pages, shop for books, search the text of a book, or even take notes while you are reading. The Kindle Touch is also larger than the basic model in terms of storage space, as it will hold about 3000 books. To purchase more books or magazines, just find the closest Wi-Fi signal and you can buy through your Amazon account and have your new reading material downloaded and ready in a few minutes. This version only connects by Wi-Fi. You can probably guess what makes the Kindle Touch 3G different from the Kindle Touch. Rather than being limited to only a Wi-Fi connection, you can also connect with this model through a worldwide 3G connection. This means that if you are in a place where you can get a cell phone signal (which is just about anywhere now), you can connect to a signal with your Kindle Touch 3G. However, unlike a cell phone connection, you don’t have to sign a contract or pay any monthly fees. The connectivity feature is paid for by Amazon. Pretty smart on their part, since it enables more users to purchase more Amazon products. If you do happen to be where there is a Wi-Fi signal, your device will recognize that and connect through that signal (Wi-Fi is usually faster than a 3G connection). The only other minor difference from the Kindle Touch is the weight – the Kindle Touch 3G is about a third of an ounce heavier. This would be due to the extra circuitry required to allow for the 3G connectivity. I’m guessing you probably won’t notice that difference in actual usage. A Kindle e-reader with full keyboard for less than $100? Yes, that’s what we have here. The Kindle Keyboard is about 3/4 of an inch taller and about an ounce heavier than the Kindle Touch, and that weight difference is due to the addition of the keyboard at the bottom. Why is it handy to have that keyboard available? There are a few instances where it becomes useful. First, you can make annotations to what you are reading, much like you would write in the margins of a physical book. Actually it’s even better because your notes are digital – this means what you write can be exported, edited or deleted. You can highlight certain select passages. You also might find the keyboard useful when you want to do a little bit of research on the reading matter. You can type in a word (or a full phrase), and your Kindle will do a complete search of all of the books in your Kindle library, books in the Kindle Store, Wikipedia, or even the web using a standard Google search. Whereas the Kindle Keyboard only connects via a Wi-Fi signal, the Kindle Keyboard 3G can connect virtually anwhere through a 3G network. So you can shop and download from Amazon from just about anywhere in the world – it’s pretty much the same connectivity required to make a call with a cell phone. This 3G connection does not require any monthly fees or commitment; it’s just always there for you to use. The Kindle Keyboard 3G also can connect via a Wi-Fi signal if you are near one, for a better data transfer speed. Most libraries, coffee shops, hotels and lots of other public places are now offering Wi-Fi signals. This one is the “big boy” of the Kindles in terms of physical size. If your primary concern is the size of the screen, the Kindle DX is probably the Kindle you are looking for. Whereas the other Kindles have screens that measure 6 inches diagonally, the DX measures 9.7 inches – more than 50% additional screen space. The weight of the device reflects this also – at 18.9 ounces, it’s a little more than double what the smaller units weigh. But keep in mind the benefit – that huge screen. Depending on the type of books and other materials you read, this could be a big advantage. Magazines or newspaper that are heavy on graphics will certainly be easier to view on the larger screen. It’s just a matter of whether or not you need so much more screen space – and if you are willing to pay the substantially higher price of $379 for that benefit. Last but certainly not least – the Kindle Fire. This is the machine that has caused quite a stir in the world of technology, and some see it as a huge competitor to the iPad. I will probably pick one up and do a full review from first-hand experience. The Kindle Fire is not so much a “color Kindle” as it is a full delivery system for any digital product you purchase from Amazon. So what are the big features causing all the buzz? Color screen – the 7 inch screen is larger than most of the other Kindle versions, but the big difference is the vibrant high-resolution delivery in 16 million colors. This is a great feature when viewing content other than the text of a book (magazines, movies, etc.). Movies and TV shows – a lot of people aren’t even aware of this, but Amazon offers a full service of purchasing or renting over 100,000 movies and TV shows. All of these can be delivered to the Kindle Fire, either as a download or streamed directly. In fact, if you are a member of Amazon Prime, you have access to unlimited streaming of over 10,000 movies and shows. Android – the underlying operating system for the Kindle Fire is Android, which is a big advantage. Apps are available through the Amazon App store – many free. Music – you can stream your music while connected, or download it and listen at your convenience offline. The Amazon MP3 store has over 17 million songs available. Document formats – you get a few options. You can view your documents in PDF, MS Word and other formats. – When you read a book on a Kindle, it really is just like reading a book in that you can read it in direct sunlight and still see it fine (the exception to this would probably be the Kindle Fire, which is backlit). Kindles use technology called E Ink which makes it look like real paper, with no glare. This also means that if you want to read in bed at night, you will need to have some type of external light source – again, just the same as if you were reading a book. Many of the Kindle covers are equipped with some type of light for this purpose. – If you know me, you know I hate ads. So when I saw that some of the Kindles being introduced now are available at a lower price that is subsidized by advertising, I was not too excited. However, let’s think this one through a minute. These ads only appear when your Kindle is not in use – they won’t interrupt your reading. So when your screensaver comes on, instead of seeing an image of a wood engraving of a dead author, you might see a special offer. And some of the offers are rather attractive – past ones have included getting a $20 Amazon gift card for $10, or a Kindle book for $1 and you can choose from thousands. So the ad-supported options may not be all that bad. – Many local libraries now offer to loan books out in Kindle format. Some Kindle books are also enabled to be shared from you to other Kindle users. These are designated as such. What do you think about the new Kindles? Are you planning to get one when they become available? Super nice article! Thanks for posting!! You explained the different Kindles very well. Thanks for being such a good teacher.